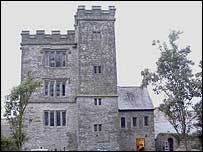 A team of ghost investigators will be at a Cornish castle on Saturday night to try to find evidence of haunting. The Paranormal Site Investigators (PSI) will use a range of equipment to record high frequency noise and changes in temperature at Pengersick Castle. Believers in the paranormal say that the castle at Praa Sands is a hauntings hot-spot. The PSI team will stay the night at Pengersick and will be equipped with scientific instruments. The team is made up of a mix of believers and sceptics. Ian Addicoat, from the team, said he believes as a ghost-hunting location, Pengersick is "unsurpassed". The most haunted area of the castle is said to be the main bedroom where people say they have heard footsteps late at night and seen orbs - or circles of light. The area around the castle, which is privately owned, was used by smugglers and there are said to be unhallowed graves.